It may sound easier said than done in the summer months, but the more timeouts you can give your air conditioning, the longer it will last -whether it’s a decade old or brand new. Take advantage of cooler days by opening windows and doors. When the temps heat up, turn on ceiling fans and use drapes or blinds to block out the sun. Clean and maintain the unit as recommended by the manufacturer. Refer to your owner’s manual for instructions on cleaning your particular unit. In some cases you can wash out the leaves and dirt, but you need to use care around coils as they can be easily damaged. Be sure to turn off the power to the AC unit before cleaning. In other cases, cleaning may be best done by a qualified HVAC contractor. Change the filters in your air conditioner regularly. How often you need to change the filters will depend on how often you use the air conditioner and the air quality but on average it should be every 30 to 60 days. If you have a UV filter or more complex system you may need to schedule regular maintenance by a professional. Remember, these small, incremental expenses are an investment in delaying the considerable expense of replacement. The better your AC runs, the more comfortable you will be. Hawaiiʻs location near the equator plus the salt in out air mean your AC needs some sunscreen too. Protect it from sun damage or erosion by shielding the unit from the elements. An outdoor awning or strategically planted foliage help keep the unit cool and prevents it from working double time to keep your home or place of business cool. 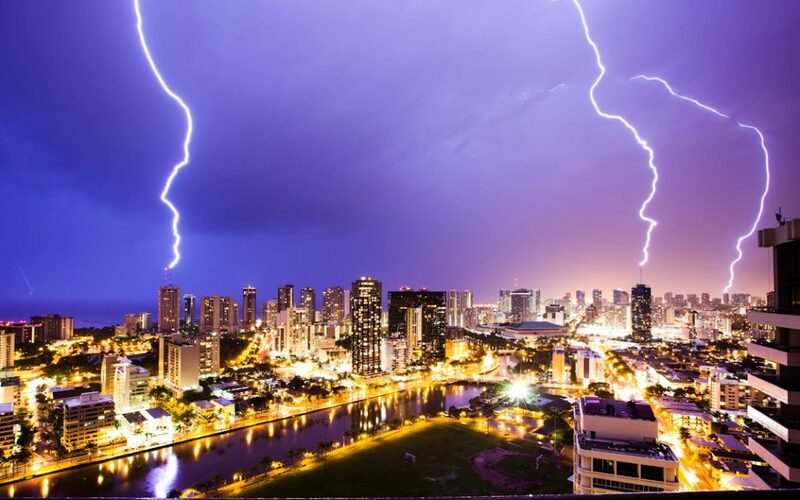 But don’t just shade and walk away — remember to have the unit checked, (especially after a storm) for foreign objects and debris, as these objects can lodge themselves in the coils and be cause for immediate repair. Even a top-of-the-line HVAC unit won’t make it the full life span without a checkup or two. As the old adage goes, “an ounce of prevention is worth a pound of cure.” Be sure to make a service call every six months. There is usually no charge for an estimate if you call before there’s a major problem, so you can save yourself considerable cost and heartache. 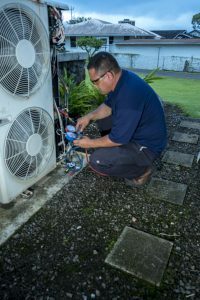 Unfortunately a desperate repair in the middle of summer is a common occurrence, and this when your AC professional is most likely to be busy. Do your family and your air conditioning a favor and get the unit looked at regularly, even if it appears to be in tip-top shape. 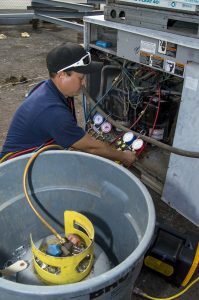 Eventually, your air conditioning will have reached the end of its life-cycle and will need a replacement. As with all appliances, if you’ve kept it in good working condition, you will have extended its life and you’ll be aware of when the end is near well before an emergency strikes. Replacing a unit under duress is always more costly. The ability to schedule a planned replacement allows you to make the best decision for the next cycle. Contact us to schedule a maintenance appointment, or to get an estimate, or set up a system evaluation. Estimates are usually free, depending on the type of estimate. Diagnostic services are quite reasonable. Our staff of cooling professionals looks forward to helping you maximize the life cycle of your HVAC system.